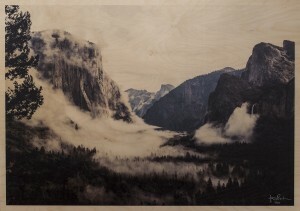 I’m pleased to see that the plywood prints I recently made are appreciated. I have added another image to the collection and hopefully there’s more to come. Go to PRINTS to have a look at these limited edition plywood prints. The exhibition is over – thanks everyone! I sincerely want to thank everyone who came to look at my photographs at Magnolia Café during the past two weeks. A special thanks to you who bought some of my work, I’m honored! I also want to say a special thank you to Per and Marcus at Magnolia for a fruitful collaboration and finally a special thanks to Pierre at Tierra for the support. Thanks everyone! The exhibition is over but it is still possible to order prints. Under PRINTS you can see what is available at the moment. I will mostly likely add some more prints later on. Should you find another photograph on the site that you would like to order as a print don’t hesitate to contact me. Linus Meyer and me. Photo by Simon Brismo. Wow! So many people who came to look at mine, Linus Meyer’s and Said Belhaj’s exhibition at Magnolia Café on the opening night. I am truly overwhelmed! I had such a great time seeing and talking to all you people and everyone seemed to enjoy themselves. The exhibition will run until November 30, so make sure you stop by. The address is Blecktornsgränd 9 at Mariatorget in Stockholm. 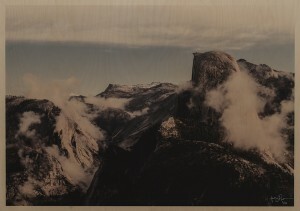 If you are interested in purchasing any of the prints they are printed in a limited edition of 10 copies each. Each copy will of course be signed and numbered. The price list can be found at Magnolia. Welcome! 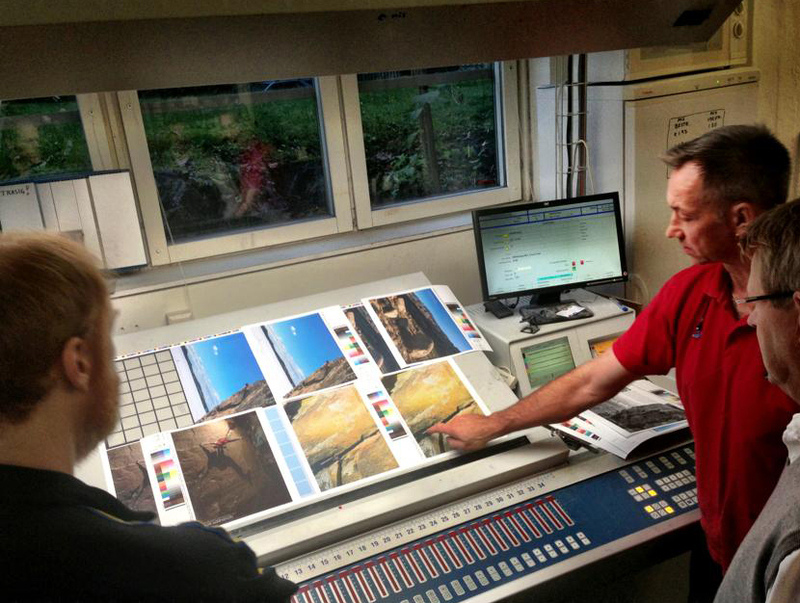 This week has been quite busy with preparations for an upcoming exhibition as well as the release of a calendar for 2014. 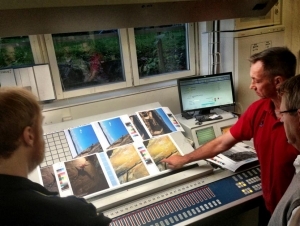 I was at the printers’ a few days ago to have a look when the calendar started going through the printing process. It looks good and I’m really looking forward to see the finished product next week. The preparations for the upcoming exhibition at Magnolia Café in Stockholm have also been going well. It’s always very difficult to pick out your best images for an event like this, but in the end I think my choice was ok. Next week I’m picking up the prints at Crimson and hopefully they all look the way I want them too. 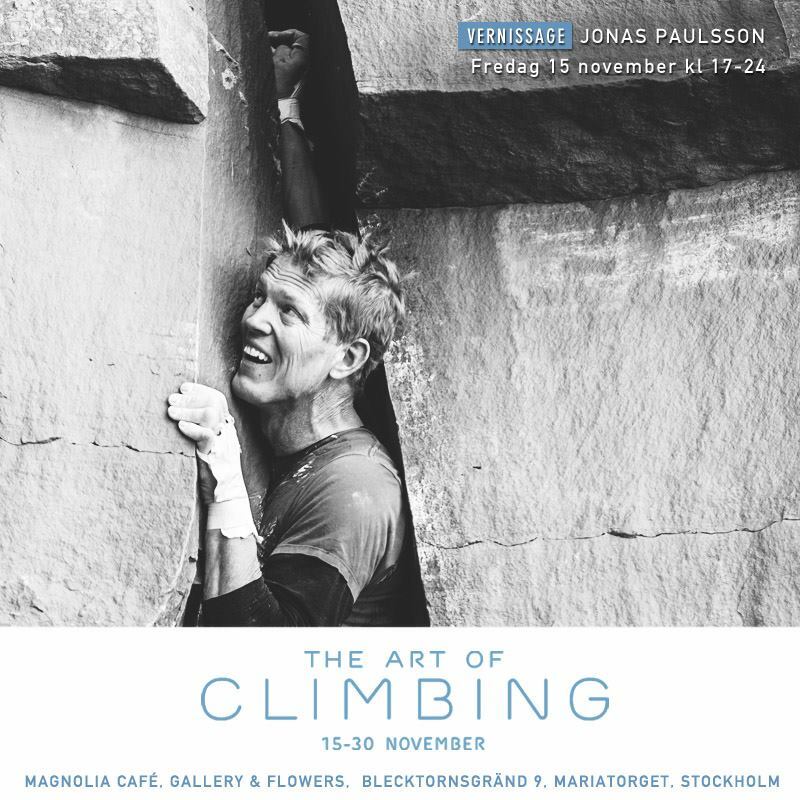 The exhibition is part of a two week climbing theme at Magnolia Café called The Art of Climbing, with lectures, music and more. Check out their Facebook page for more information. 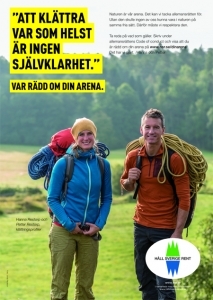 The exhibition is sponsored by Tierra and the calendar has been made possible through cooperation with addnature.com. 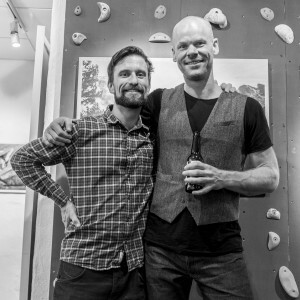 Last weekend I hooked up with my good friends Hanna and Petter Restorp. 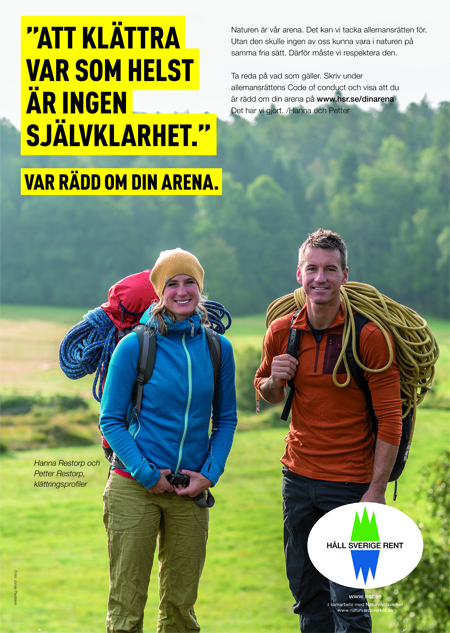 They have agreed to participate in a campaign to raise awareness of the Right of Public Access and the organization behind the campaign, Håll Sverige rent (”Keep Sweden Tidy”), needed some photos of Hanna and Petter for a poster. Here’s how it turned out.